Theatre and Meal Tickets from £22 at Theatre Tickets Direct Experience some culture by wining and dining before your theatre show. Packages start from just £22. Up to 25% Off The Woman in Black Tickets at Theatre Tickets Direct Get up to 25% off the atmospheric thriller The Woman in Black at Theatre Tickets Direct. The Lion King Tickets from £41.65 at Theatre Tickets Direct Take your place in the circle of life and witness the critically-acclaimed musical: The Lion King. This spectacular show is perfect for the whole family so book your tickets now from just £41.65. Hakuna Matata for now! Up to 40% Off The Worst Witch Tickets at Theatre Tickets Direct She may be the Worst Witch, but this will be the best show you'll see all year! Save up to 40% off your tickets for The Worst Witch at Theatre Tickets Direct right now. Gift Cards form £25 at Theatre Tickets Direct Stuck for gift ideas? If you know someone who loves the theatre, a gift card from Theatre Tickets Direct could be the perfect present. Aladdin Theatre Tickets from £30 at Theatre Tickets Direct You ain't never seen a show like this! See the amazing story come to life in a whole new world at the Prince Edward Theatre! Tickets are available from just £30, so grant someone's wish and get your seats booked in now. Up to 45% Off Rip It Up: The 60s at Theatre Tickets Direct Bring the smashing 60s into the 21st century with songs, dance, acrobatics and amazing visuals for less with up to 45% off tickets at Theatre Tickets Direct. Up to 33% Off Thriller Live at Theatre Tickets Direct Enjoy a sensational night of music at Thriller Live! Right now at Theatre Tickets Direct, you can save up to 33% on your tickets! 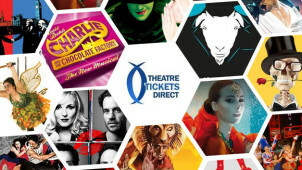 Theatre Tickets Direct have been operating for over 7 years, and are able to get the great prices on tickets thanks to their connections with suppliers. They can pass these savings on to you, and you can get an even better deal if you use the Theatre Tickets Direct offers here at vouchercloud. Theatre Tickets Direct source tickets to all the best performances, and are able to offer all kinds of different seats. Whether you like to sit on an aisle, up on a balcony or as close as possible to the action on stage, they can help you get your ideal theatre experience for less. Copy your discount code on your computer or mobile device and paste it into the voucher code field when you book your tickets with Theatre Tickets Direct through their website. Not all of the Theatre Tickets Direct deals you'll find at vouchercloud actually require you to enter a special promo code to access the discounts. Some Tickets Direct deals can be claimed automatically when you book, and we'll tell you if this is the case on the relevant 'View Deal' screen. Enjoy more for less every time you visit the West End by joining vouchercloud free and adding Theatre Tickets Direct to the brands you want to watch! Check out the show and meal packages on offer at Theatre Tickets Direct if you want to save on having a lovely meal at a time suitable for your theatre booking in a popular nearby restaurant. Can I take my child to the Theatre? Babies are not permitted to attend theatre performances, but children over three can attend provided the accompanying adults are confident they will not make a noise and distract other guests. There is no discount for children, however, and all children must occupy their own seat with their own ticket. Pay attention also to the write up of the show you've chosen, as some have content that isn't suitable for younger viewers. Can I change the date of my Theatre Tickets Direct tickets? Once tickets have been purchased they can't be changed to a different performance, so be sure you can make the show you have chosen when you buy. Can I cancel a booking with Theatre Tickets Direct? Once booked, tickets cannot be cancelled by the customer - however, if for any reason the show itself is cancelled you will get a full refund. Taking in a West End show, a beautifully-performed ballet, or a play can be one of the best ways to spend an evening in London. With Theatre Tickets Direct, you can get some exceptional deals on highly sought after West End performances, including hugely popular shows like The Lion King, Wicked and Book of Mormon. Good seats can come even cheaper when you use a Theatre Tickets Direct promo code to make your booking online! Whether you want to see a critically acclaimed stage production or a fun musical your family will love, you will find the best tickets at the best prices at Theatre Tickets Direct. How do I use my Theatre Tickets Direct discount code? If you are planning a trip to London, you can book with Theatre Tickets Direct to have your tickets left with the concierge at your hotel. You can pick them up as you check in, to be sure you'll have them ready for that special evening! Alternatively, tickets can be sent to your home by special delivery. While there are all kinds of impressive, memorable performances every single night in London, for many people seeing a musical is one of their 'must do' experiences when they visit the capital. Musicals are what the West End is famous for, and Theatre Tickets Direct has tickets for all of them, from the latest new shows to long running classics from the likes of Andrew Lloyd Webber and Disney. Make sure you’re there to watch the curtains go up by using a Theatre Tickets Direct discount code to save on the cost of your tickets, and maybe even enjoy a dinner and drinks before or after the performance!